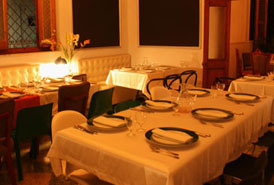 Reopened by Hector Higueras in October 2011, Le Chansonnier used to be a French-themed private restaurant cluttered with antiques, an average if not run of the mill place to eat. Its reinvention has left little trace of the old interior of the house, which dates back to 1860. Le Chansonnier is now a haven of contemporary chic that integrates all of Havana’s coolest elements: beautiful young staff, great music, sensitive lighting and décor, as well as what must be the coolest toilet facade in Cuba (created by artist Damián Alquiles). This is quality nouveau cuisine – without the silly small portions – put together by experienced chef Enrique. For starters, try pulpo en tinta de calamar (octopus in squid ink), caviar de berenjena (aubergine caviar) or sopa de cangrejo (crab soup). The best main courses include pato le Chansonnier (duck le Chansonnier), pechuga de pollo con salsa de tamarindo, (chicken breast with tamarind) and pescado a la provenzal (fish provencal). Desserts are reasonable, the coffee is good and our only complaint would be the limited and overpriced wine menu.